Tamara Milashkina (soprano) – Tosca; Vladimir Atlantov (tenor) – Mario Cavaradossi; Yuri Mazurok (baritone) – Scarpia; Valeri Yaroslavtsev (bass) – Angelotti; Vitali Nartov (baritone) – Sacristan; Andrei Sokolov (tenor) – Spoletta; Vladimir Filippov (baritone) – Sciarrone; Mikhail Shkapstov (bass) – A jailer; Alexander Pavlov (alto) – A shepherd boy. Re-issues of good analogue recordings from Melodiya in attractive, compact digipacks have been coming thick and fast of late. I was attracted to this one by the presence of three former Bolshoi star singers and a celebrated conductor, but I have to say that it is hardly competitive with established classic recordings for a number of reasons. The sound is very acceptable, if a little harsh and close. This tends to accentuate the brashness of Ermler’s conducting and the coarseness of the orchestra’s string tone. This may be suggestive of Italianate passion but Puccini’s music deserves more subtlety. 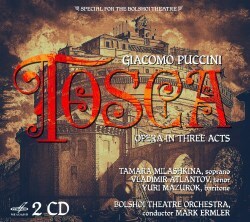 Despite the absence of a libretto, the synopsis is quite thorough; unfortunately the English translation of the notes has not been done by a mother-tongue speaker, hence the cover blazes the legend “Special for the Bolshoi Theatre” (whatever that means) and we read that “Tosca” is “one of the most favourite works among broad quarters” and that Puccini “created succulent … characters”. The French translations look better. Trivial matters such as translation aside, the recording must stand or fall on the quality of the singing. Not to prevaricate, Tamara Milashkina’s Tosca here just sounds all wrong. She has throaty, “ingolata” vocal production, whereby all the vowels are in the back of the throat, Russian-style, without any of the necessary Italianate forwardness of diction. Her sound is often squally and matronly and the tone is hooded in the lower regions of her voice. Her vibrato is often obtrusive and there is little seductive warmth in her characterisation; she is all harridan. She manages a touching conclusion to “Vissi d’arte” within the limitations of her acidic tone and swallowed articulation. Oh dear, no. Vladimir Atlantov was a famous Otello and a Bolshoi stalwart, especially good in Russian repertoire such as “Prince Igor”. There is not much allure in his edgy, stentorian tone and he sometimes defaults into a bleat; he tends to slide up to top notes and does not make much of the Italian text but he is heroic in a generalised way. The best singing comes from a suitably raucous and plangent treble as the shepherd boy in his brief serenade opening Act III and from one of my favourite Russian baritones, Yuri Mazurok. He has a lean, bright, forward baritone with easy top notes and a tenorial cutting edge which lends him the requisite bite to convey Scarpia’s urbane cruelty. In contrast to his Tosca, his words are always forward but he does not have the variety of colour that Gobbi brings to the role, for all that he sings elegantly. Several of the comprimario singers have detectable Russian accents to their Italian, confirming that as a performance, Mazurok apart, this simply isn’t idiomatic enough to convince and certainly represents no competition to established recommendations such as the two Callas recordings, Tebaldi either live or in the studio, or Muti’s studio version with Vaness. If you want to hear a great Russian Tosca, I suggest Vishnevskaya’s gripping and original recording conducted by her husband, Rostropovich – but this recording under review is a non-starter.